Conquest is set around a pivotal historic period culminating in 1066 with the Battle of Hastings. Three powerful leaders will pit themselves against each other in a bloody contest to the death: Harold Godwinsson, King of England; Harald Hardrada, King of Norway; and William, Duke of Normandy. The prize, England. The winner, William. After the battle is won, the English continue struggling to overthrow William’s rule. A legend arises of a wily English freedom-fighter whose ongoing resistance to the rapacious Norman conquerors makes him a folk-hero and symbol of stubbornly independent English spirit. That man is Hereward of Bourne, a warrior mercenary known now as Hereward the Wake, but in his own lifetime as Hereward the Outlaw or Hereward the Exile. Fact and fantasy tangle inextricably even in contemporary chronicles of Hereward’s exploits, making him the perfect subject for a historical adventure with a touch of fantasy. A bold youth of striking looks and powerful build, Hereward is a thegn’s son who grows up roaming the woods and marshy fens of his father’s lands in Lincolnshire. Like many eleventh-century Englishmen, he is of mixed Anglo-Saxon and Scandinavian blood. 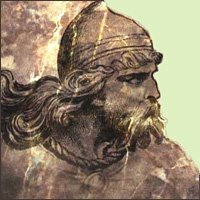 Disruptive, wild and hot-headed, Hereward is a born rebel. In 1053 King Edward the Confessor banishes him from England. The eighteen-year-old exile's travels take him full circle throughout the known world in search of his destiny, following a mysterious talisman of power and its guide, the wise and beautiful Torfida. Hereward the Wake, a modern English translation of the Latin chronicle Gesta Herewardi (The Exploits of Hereward) written by a twelfth-century monk.